We are a gathering of thinkers, doers, artists, dreamers, muckrakers, and builders interested in life on the water. We construct a floating city on the Sacramento River Delta at Mandeville Point and live on it for seven days. There are no tickets, no central organizers, no rules, and no Rangers to keep you safe. You must practice radical self-reliance, if you want to have a good time. What's it like to attend? Here's a slideshow from past years of Ephemerisles. Also see Judd Weiss's pictures from Ephemerisle 2014. Since there's no central organizer, the event only happens if people contribute. Seasteading. 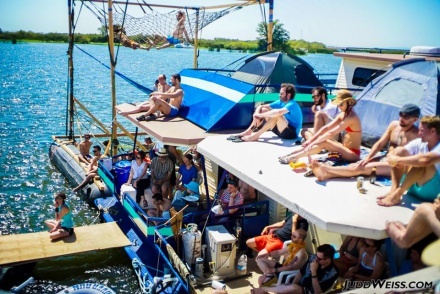 Ephemerisle was started by The Seasteading Institute (TSI), a non-profit devoted the creation of long-term human communities on the water (aka seasteading). Although the event is now entirely community run, many of the attendees continue to be enthusiasts of living on the water. Art. A society without art has no soul. Just as Burning Man has inspired art in the desert, we want to inspire art on the sea. Learning. One of the goals of TSI in starting Ephemerisle was to give people who may not have much boating experience the opportunity to gain nautical skills: anchoring, sailing, ropework, etc in a relatively safe environment. In addition, many of the attendees are scientists, engineers, artists, entrepreneurs and activists, who frequently have fascinating stories to tell. There are many opportunities to learn from each other at Ephemerisle. Community. Spend a week rafted up on the Delta with awesome people, and you can't up but connect with old friends, and make new friends. Before anything else, PLEASE READ THE survival guide!! The Survival guide contains important "how tos" and information on having a fun, safe time. Looking for a berth? Join a crew! The Facebook group can sometimes have an overwhelming amount of discussion. Join the Ephemerisle Announcements Only mailing list to receive important announcements. For several years, Ephemerisle began on the first Monday after July 11. However, as Ephemerisle grew, the amount of build time required for some islands, such as Elysium, grew as well. As a result, the start of build began pushing up against the July 4th weekend. Many of the build crew members attend events during Fourth of July weekend, such as family reunions, Priceless, Camp Tipsy, etc. Immediately starting Ephemerisle build after those events became difficult for those crew members. Therefore, many of the island leads requested to change the start date for Ephemerisle to the Monday of the last full week in July. After some discussion, a survey of the community found that most were either supportive or neutral towards the proposed change. Here's a few things you can do: bring art, give talks, build your own boats and platforms, rent a truck and help carry floating platform parts, build illumination, make music, bring a wakeboard, and help build this wiki. Attend scheduled pre-Ephemerisle events. If there's none listed, check back regularly. Help create / maintain this wiki. Ask Adam Katz for access and see the wiki todo list. This page was last modified on 13 April 2019, at 00:36.